A “Blood Rave” reminiscent of the famous bloody opening sequence from Blade (1998) intends to spray 5,000 litres of blood on dancers on Halloween at an undisclosed location in Amsterdam. My first stop was the event’s URL, www.blood-rave.com, which redirects to the “Blood Rave” Facebook event page. As of this writing (Aug. 28, 2015), the page showed 3.9k people were attending, 739 were listed as “maybes” and 4.2k had been invited. By clicking on “Tickets Available” on the Facebook event page, you are taken to a ticketscript link revealing tickets can be purchased for €24,50 and the event time is 11 p.m. to 5:30 a.m. Buyer beware: the event is listed for people 18 and older only. The ticketscript page shows the event at a “Secret Location.” The event’s Facebook page is flooded with hundreds of comments from potential ticket buyers asking about event details, music headliners and general comments about the blood. Without scrolling through pages of comments, from what I can see very few responses from the event coordinators. The only potential lead is where the Facebook event page says “Hosted by Blood Rave,” but clicking on “Blood Rave” just takes you to Blood Rave’s Facebook page which also doesn’t reveal much information. Another dead end. Before aborting this lead, I messaged the page introducing myself on Aug. 24, hoping for a response. The article gave me an associated event name, but I needed a company name. I tracked down the company holding the event by finding the owner of the blood-rave.com URL through a domain info search. The URL was registered Aug. 12, 2015; within minutes I had a name, phone number and email address, which I contacted immediately on Aug. 24. As secondary confirmation, I found the owner of the company through LinkedIn. Through the domain registration information, I was also able to identify the promotions company: Insight-Events. I checked out their website and found out that they specialize in raves incorporating paint technics; “Neonsplash,” one of their major events, is described as “Europe’s Largest Paint-Party” where “thousands of liters of neon-paint” are sprayed on the audience. This made total sense when you consider the concept of spraying the crowd with blood. Interestingly, their website doesn’t list “Blood Rave” at all. 1) Is the location undisclosed as you don’t have one booked yet? I know you use paint technics so finding venues that let you make a mess must be challenging. Is there any way of finding out what city it will be in or the location? 2) Can you tell me more about the sprinkler system you will use? Is this something that is transportable? How does it work to accommodate the the substance you an on using? 3) Can you confirm contrary to popular rumors you will be using synthetic blood? Is so what can you tell me about the challenges finding a supplier that would sell that quantity and how much are you planning on using? 4) Why be so secretive about the event and not advertising it on your promotional company’s website? 5) How did you come up with the idea? Was it influenced from the Blade movie? 6) how are your ticket sales as of now? Do you anticipate a sell out? Although there has been no word on who’s performing as of yet, the promotional company teased “house, techno and beats” as the genres of choice on the Facebook event page. Yet, this selection has been met with some hesitation from potential attendees who seem to desire more industrial and drum n bass type music to better fit the theme and better accompany the original inspiration. Being an ex-raver from the late 1990s, I remember some crazy parties, but nothing like what is depicted in the movie Blade. This pushed my curiosity to see if I could track down such a party already in existence. Not only did I find others, but they involved similar elements: on Oct. 31, 2013, Club Ampersand, New Orleans, hosted an 18+ event called “NeonGLOW Blood Rave” headlined by Beverly sKILLZ. 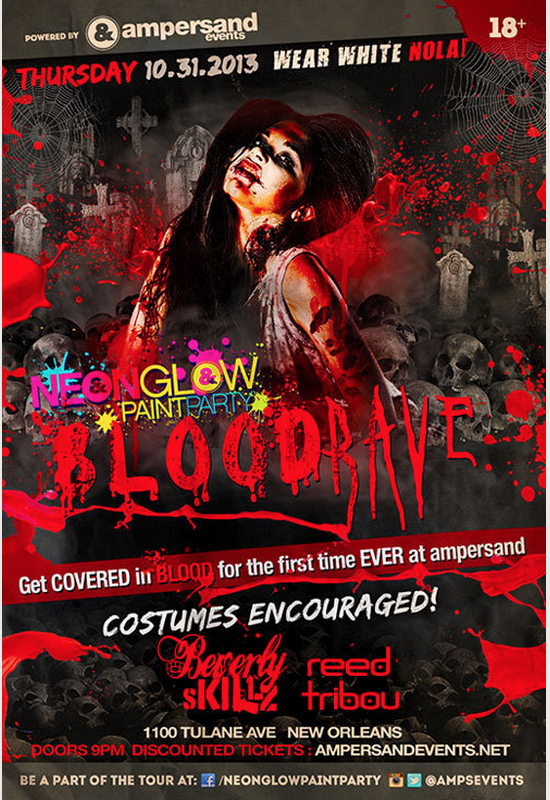 The event’s promotional poster boasted: “Get COVERED in BLOOD for the first time EVER at ampersand”. But there is no indication actual blood was used: the event clearly used paint to simulate the effect. Almost a year later, Capitol VIP Night Club in Raleigh, N.C., hosted a “Night of the Demons Blood Rave” on Oct. 30, 2014, calling it “THE BIGGEST, SCARIEST, & WILDEST PAINT PARTY IN RALEIGH!” No actual blood was used, but “GALLONS OF BLOOD PAINT” was. Unlike the Dutch event, the Raleigh rave wasn’t inspired by Blade, but by cult horror film Night of the Demons (1987). I wasn’t able to find any other events that resembled the upcoming Dutch event, but I did stumble across a movie called Blood Rave—at least, that’s what it was supposed to be called. Paint technics for raves are setting the trend in the party business world and the concept of the blood rave is kicking things up a notch for the spookiest holiday of the year. Blade may have set the standard in 1998, but seventeen years later Insight-Events is going to make it reality for potentially thousands of bloodthirsty ravers. If they can pull this off, I think they may have just set a new precedent for Halloween parties to come. spray 5,000 litres of blood on dancers: Janene Van Jaarsveldt, “Blood Rave to Douse Amsterdam Dancers in Gallons of Blood,” NL Times, Aug. 20, 2015, accessed Aug. 26, 2015, http://www.nltimes.nl/2015/08/20/blood-rave-to-douse-amsterdam-dancers-in-gallons-of-blood/. archive.is link: https://archive.is/cMOlu. 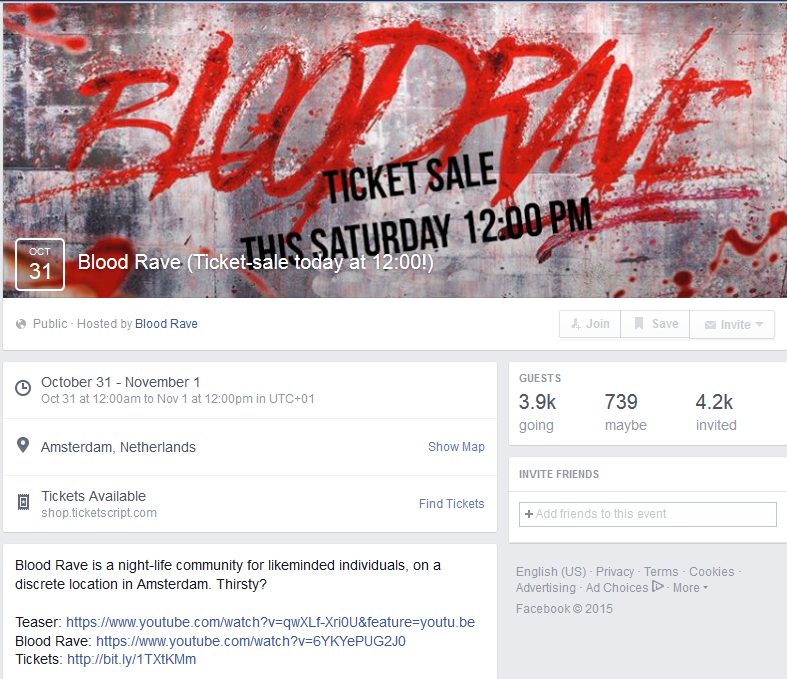 redirects to the “Blood Rave” Facebook event page: “Blood Rave,” Facebook event posted by Blood Rave, accessed Aug. 26, 2015, https://www.facebook.com/events/119185328427294/. archive.is link: https://archive.is/QI1n3. The event is scheduled to take place on: Ibid. event page offers a YouTube teaser video: “Blood Rave Intro,” YouTube video, 4:07, posted by Blood Rave, Aug. 21, 2014, accessed Aug. 26, 2015, https://www.youtube.com/watch?v=qwXLf-Xri0U&feature=youtu.be. archive.is link: https://archive.is/t984A. an unlisted eight second Youtube video: “Blood Rave,” YouTube video, 0:08, posted by Blood Rave, Aug. 19, 2014, accessed Aug. 26, 2015, https://www.youtube.com/watch?v=6YKYePUG2J0. archive.is link: https://archive.is/UjDdm. 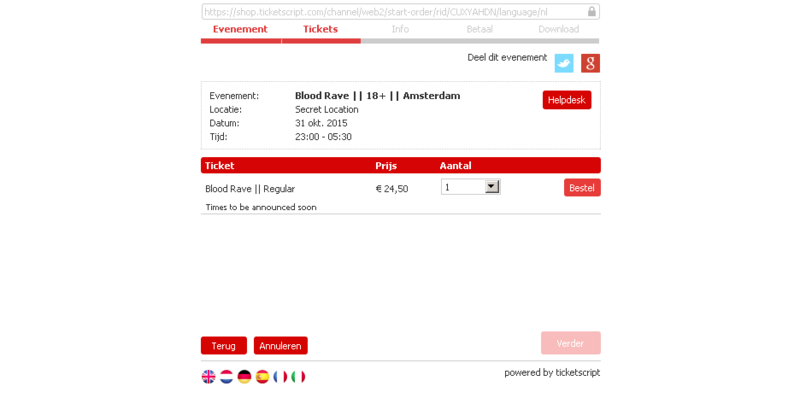 a ticketscript link revealing tickets can be purchased for €24,50: “Blood Rave || 18+ || Amsterdam,” ticketscript, accessed Aug. 26, 2015, https://shop.ticketscript.com/channel/web2/start-order/rid/CUXYAHDN/language/nl. archive.is link: https://archive.is/TuoRJ. a Quote article by Henk Willem Smits: Henk Willem Smits, “Organisator Neon Splash komt met ‘blood rave’: dansen onder douche van bloed,” Quote, Aug. 20, 2015, accessed Aug. 26, 2015, http://www.quotenet.nl/Nieuws/Organisator-Neon-Splash-komt-met-blood-rave-dansen-onder-douche-van-bloed-161310. archive.is link: https://archive.is/THtYW. one of their major events: Insight Entertainment BV, “Neonplash – Paint Party,” Insight-Events, 2015, accessed Aug. 29, 2015, http://insight-events.com/portfolio-item/neonplash-paint-party/. archive.is link: https://archive.is/S19mb. their website doesn’t list “Blood Rave” at all: Insight Entertainment BV, “Agenda,” Insight-Events, 2015, accessed Aug. 26, 2015, http://insight-events.com/agenda/. archive.is link: https://archive.is/5LRHq. Only one upcoming event is listed: “7 November – Neonsplash – Amsterdam, Ziggo Dome”. The event’s promotional poster boasted: Ibid. Night of the Demons Blood Rave: “Night of the Demons Blood Rave,” Eventbrite, 2015 , accessed Aug. 26, 2015, http://www.eventbrite.com/e/night-of-the-demons-blood-rave-tickets-12760931289. archive.is link: https://archive.is/eEY52. had this to say in a blog post: John Fallon, “Blood Rave aka Trance Art and TV Spot!,” The Official John Fallon Blog (blog), Nov. 6, 2014, accessed Aug. 26, 2015, http://www.john-fallon.com/?p=2884. archive.is link: https://archive.is/nO9Zm. Here’s the TV spot: “TRANCE aka BLOOD RAVE TV Spot,” Vimeo video, 0:30, posted by John Fallon, Nov. 6, 2014, accessed Aug. 30, 2015, https://vimeo.com/111120733. archive.is link: https://archive.is/e4vIo. If you’re interested in vampire-themed events for Halloween, try “There Are Such Things! Vampire Studies Symposium 2015.” For further details, visit: http://vampiresymposium.com. Erin is Vamped’s Co-administrator. She is the owner of Vampire Classifieds and Horror Classifieds. She has 2 turtles; has 15 piercings and 5 tattoos; loves turtles and walking around in bare feet. She has a degree in marketing and sales and has been in the industry for over 12 years. She lives in Vancouver, Canada. Gaga for Blood: Is AHS: Hotel’s Countess a Real Life Blood-Drinker? Why Does This Dracula Exhibition Need $20,000? World Dracula Day: Happy 120th Birthday, Count! Was the Preface to the Swedish Dracula Written by a Priest? Vamped is a general interest non-fiction vampire site. We publish interviews, investigations, lists, opinions, reviews and articles on various topics. A Drink of Blood a Day Keeps the Doctor Away: Do Sanguinarians Have Digestive Issues?